I adopted my Neemo as a puppy, him and his sister were rescued from bad breeders who overbred their parents. Only my 2 rescued puppies survived after weeks of vetcare. 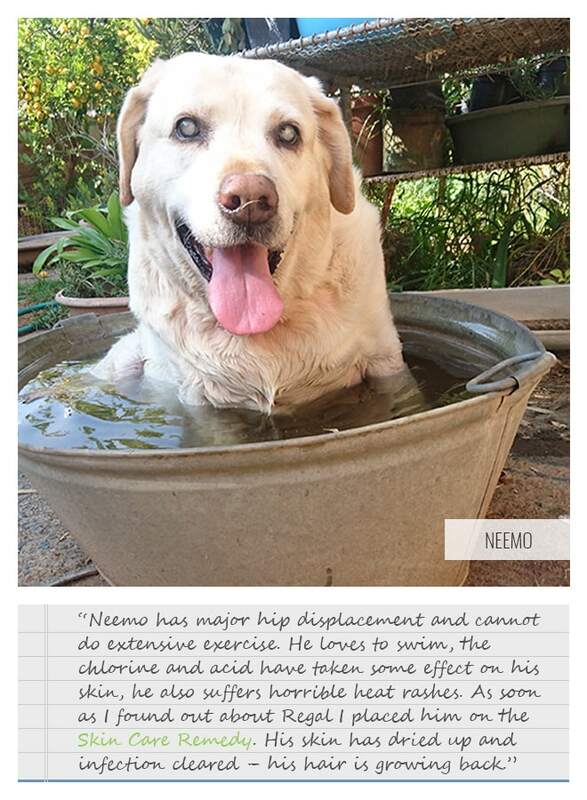 Neemo has major hip displacement and cannot do extensive exercise. He loves to swim, the chlorine and acid have taken some effect on his skin, he also suffers horrible heat rashes. As soon as I found out about Regal I place him on the Skin Care Remedy. Neemo loves the flavour and gobbles up the food which we pour Regal over. His skin has dried up and infection cleared – his hair is growing back.